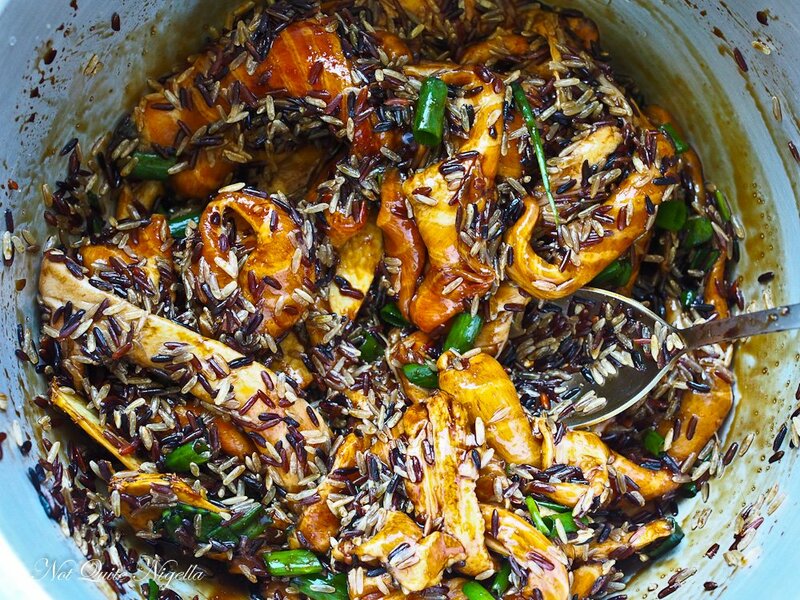 Waste Not: Salmon Belly Wholegrain Rice Pot That Is Also Good For You! 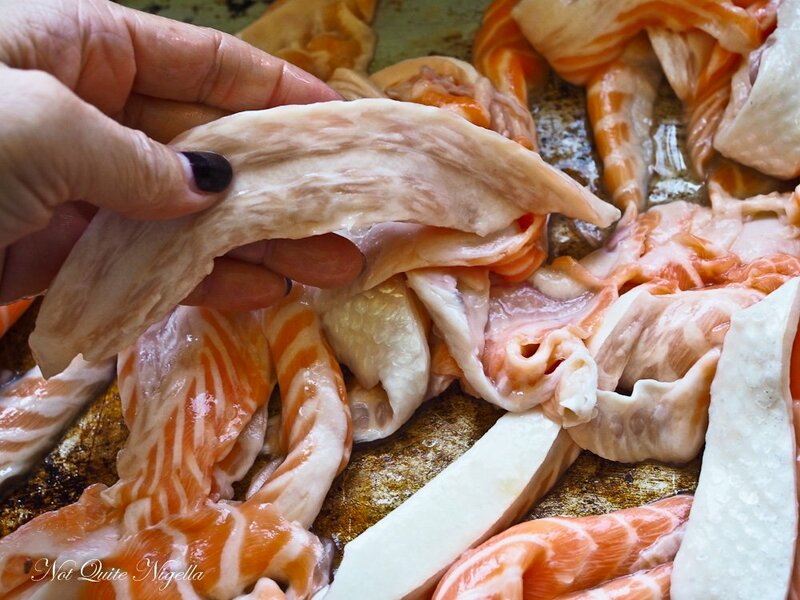 Here's a great cut to seek out next time you're at the fishmongers: salmon belly! It's cheap as chips ($5 a kilo roughly) and loaded with Omega 3 fatty acids. Here's a recipe that makes the most out of this luscious cut. And an added bonus: salmon belly is said to be great for your skin! The saying goes that you are what you eat but in the last few months, I've been looking at my skin and wondering if my haphazard way of eating isn't somehow negatively affecting it. It doesn't help when I accidentally turn my phone on and realise that I have the camera on selfie mode. It is truly terrifying seeing yourself from that angle? OMG are those jowls? And once I accidentally screamed at my own reflection which was not unlike Jabba the Hut. It was more a terrified gurgle of horror more than anything else which only meant more jowl but I digress.. I've been reading up and a lot of people say that salmon is good for skin and fish oils are excellent oils. I recently came across a cut at my fishmongers. It was sold in trays for $5 a pop and 800grams or 28ozs of salmon for $5 is a bargain. Salmon belly as the name suggests is a fatty cut. I'd go so far as to describe it as bone marrow like. It has that wonderful wobbly effect to it. It is also full of Omega 3 fatty acids or good fats. These help maintain healthy cell membranes as well as affecting the ability for the skin to retain water. Some say that they also help reduce inflammatory reactions in the cells. For me though salmon belly is incredibly tasty, especially for an off cut. 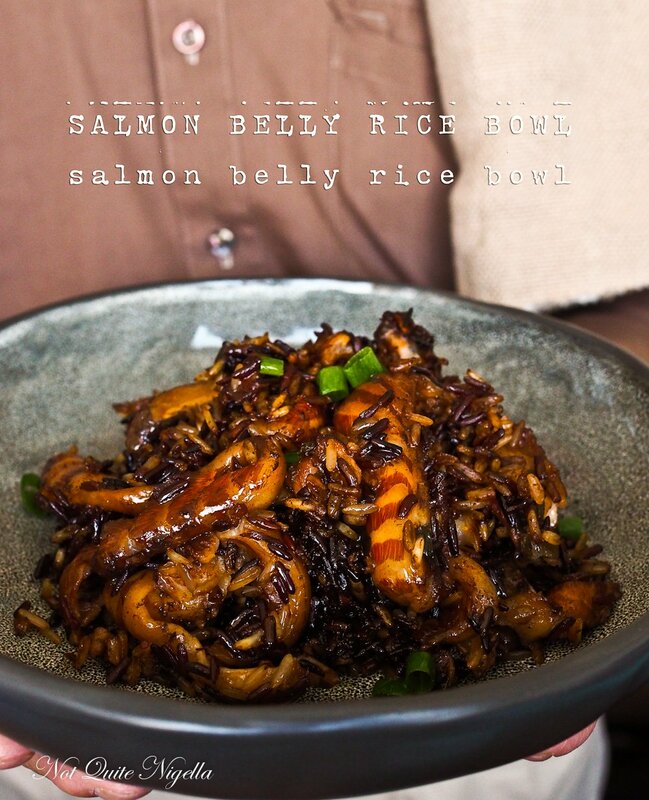 I've brought salmon belly home a few times over the last while and played with a few recipes before realising that the best way to eat salmon belly is by cooking it in a rice cooker. From the 800 grams of salmon belly, I took out all of the fat only pieces (white only) and trimmed a couple of pieces. I know I just explained how good the fat is but I also need to fit into my clothes and fat is still fat in terms of calories and we'll get plenty of good oils through the other pieces. This left me with about 650grams/23ozs. of salmon which is still a steal at $5. 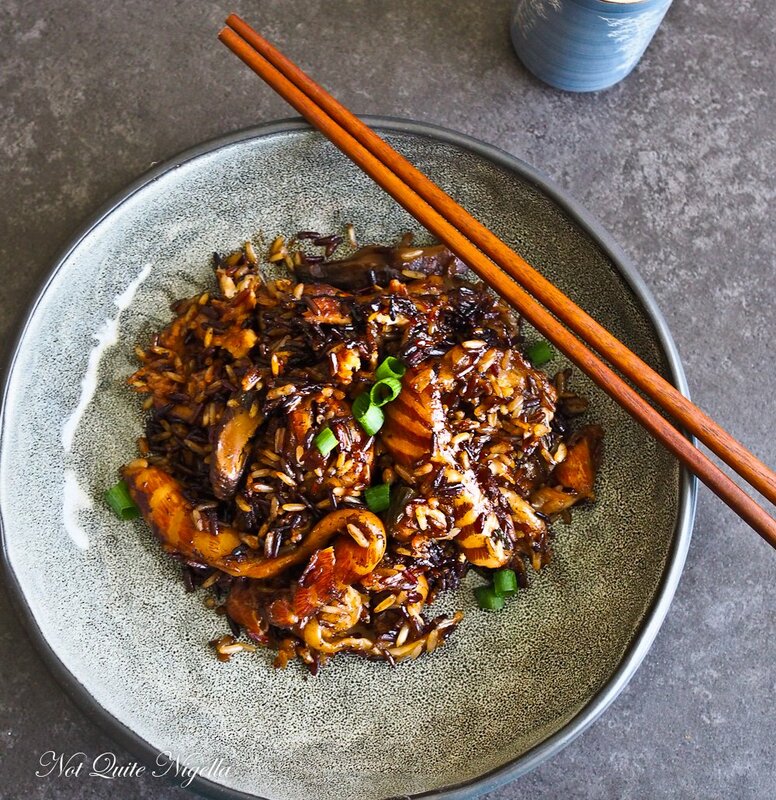 I marinated it in a very simple soy sauce, ginger and green onion mix with rice for half an hour before heating it with some water in a rice cooker. For those of you that worry that this will be too fishy don't worry, the aromatics in the sauce are stronger than any salmon smell and what you will get in about half an hour is an incredibly tasty dish. The big test was Mr NQN or Jack Sprat who doesn't like bone marrow and dislikes fat. What would he think? He loved it and to this day he doesn't know that he was eating a fatty cut, I just sort of said nothing when he said he loved it. Given how expensive tuna belly is, it's probably only a matter of time before the price increases on this luscious cut but for now, this is the best $5 bargain! So tell me Dear Reader, do you ever buy offcuts or bargain cuts? How often do you eat fish? Do you tend to go for a particular type of fish? It's not pretty but it's delicious, I promise! Step 1 - Mix the salmon belly, rice, ginger, two soy sauces, sugar, cooking wine, onions and salt together in the rice cooker bowl. You can also do this in a saucepan too. 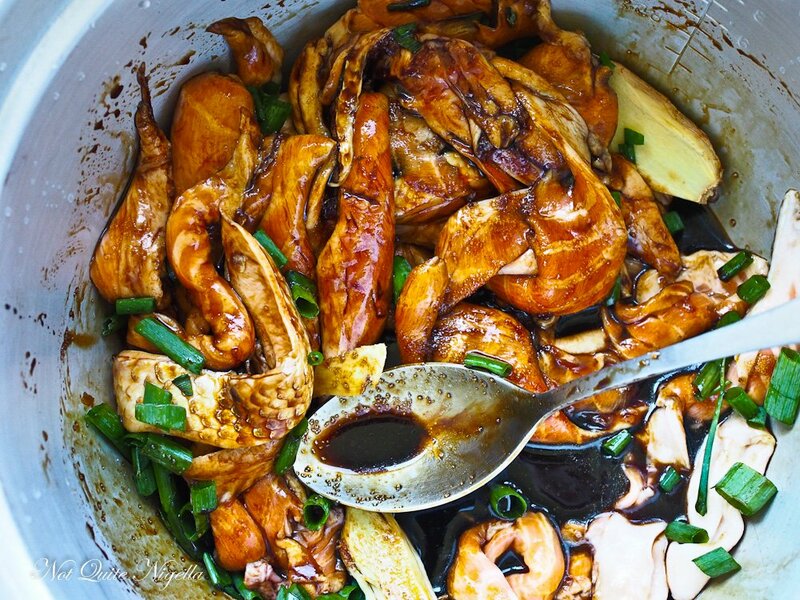 Marinate for 30 minutes. *Step 2 - * Add the water and turn on the rice cooker and cook until the rice is done. recipeCrustless Salmon Sweet Potato Pie - A Nourishing Winter Favourite! recipe Crustless Salmon Sweet Potato Pie - A Nourishing Winter Favourite!